The story of one of Rhode Island’s best-kept World War II wartime secrets is briefly recounted in our book “World War Two Rhode Island” (The History Press; 2017). The material was drawn from a story written for these pages back in 2016. Now and then, I’ve been asked for more details about this tale, so here they are. On Darby Road in Scituate, RI, near the top of the seventh highest point in the state (732 feet above sea level) is the site of what was once one of the nation’s best kept secrets during World War II: the Chopmist Hill Monitoring Station. In March of 1941, the Federal Communications Commission’s Radio Intelligence Division (RID) set up a network of thirteen top-secret radio monitoring facilities designed to eavesdrop on German and Japanese radio traffic. A top agent in the RID was a Bostonian by the name of Thomas B. Cave. He not only discovered the Rhode Island site. He went on to command the monitoring station right through the end of the war. His initial assignment had been to set up a connection with an existing direction-finding facility in Bar Harbor, Maine (similar sites were being established along the Eastern seaboard prior to America’s entry into the war). While traveling around New England, Cave came upon a 183-acre farm atop Chopmist Hill owned by William Suddard. It didn’t take him long to figure out that the location could do a lot more than help triangulate a radio signal. By an odd coincidence of terrain and atmospheric conditions, this particular property turned out to be the most effective of the RID’s national network of stations. A team of 40 radio operator technicians quickly arrived to set up shop in the 14-room farmhouse atop Chopmist Hill (Suddard and his family obligingly leased their home and property to the government and moved out for the duration). 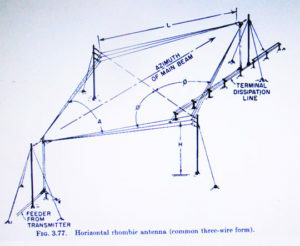 The long wire antennas and other types of receiving antennae were connected to the farmhouse where technicians set up six rooms full of sensitive radio receivers and transmitters. A pair of outbuildings housed two sensitive direction finders. Chopmist Hill was in business. The farmland and buildings were surrounded by barbed wire and powerful security lights. An emergency generator provided backup power. Staff lived in bunkhouses on site. Armed guards patrolled the area. A warning sign on the approach road read, “ In the event of an enemy attack on Rhode Island, this highway will be closed to all save military vehicles”. Local residents figured something was up, but they had no idea what. Actually, the technicians themselves were not fully aware of the ultimate use of their activities and the material they collected (although they probably had a good idea once America entered the war and the scope and amount of information steadily grew). Working in shifts 24/7, the technicians monitored signals broadcast in the clear and also copied down encrypted messages. All information was relayed by Teletype to Washington DC for appropriate action, often immediately on receipt. As soon as the equipment was tuned up, operators were able to listen in on transmissions by German spies in North Africa and South America and exchanges between German headquarters and military units in Europe and North Africa. Once the location of the spies’ signals was identified, they would be rounded up and, in many cases, turned to counterespionage purposes. American intelligence agents’ transmissions were also monitored and, if it was discovered the enemy was on to them, they could be warned. The Chopmist Hill equipment was so sensitive and the location so ideally situated that the technicians could pick up low-power radio signals between General Erwin Rommel’s Afrika Corps tanks and relay critical troop movement information to the British. The Rhode Island station personnel also monitored weather reports that were key to enemy activities. Access to local weather information assisted the British and later, U.S. Army Air Forces in setting up bombing missions. 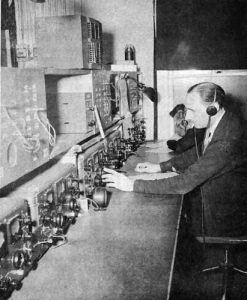 German strategic and diplomatic transmissions were broadcast on frequencies that could not be picked up by the British, but did bounce through the atmosphere across the Atlantic to Scituate. 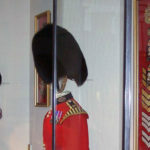 These were also relayed to the British before and then after the U.S. entered the war. 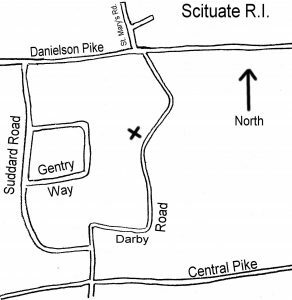 Map noting the location of the secret radio monitoring station. Unexpected signal anomalies also enabled the Chopmist Hill technicians to pick up Japanese transmissions from the Pacific. Then FCC Commissioner George Sterling, in an interview conducted long after the war was over, said he was surprised that the US was caught unaware by the Attack at Pearl Harbor. He told a reporter that for several months before December 7, 1941, the Scituate monitoring station was routinely intercepting Japanese military transmissions that indicated some action was pending (U.S. cryptanalysts had already broken key Japanese codes). In 1944 and into the following year, the Chopmist Hill station helped defeat Japanese attempts to bomb the U.S. mainland with TNT-laden hot-air balloons. The devices, called Fu-Go (or “fire balloon” in Japanese), were equipped with small radio transmitters to help the Japanese keep track of their progress. Scituate picked up these low-power signals thousands of miles away, relayed the information to Washington DC and U.S. fighter planes were dispatched to shoot the balloons down (a few managed to reach the US but their existence was kept a deep secret by the government). At one time, Chopmist Hill even helped save the famed Queen Mary from being sunk with more than 10,000 troops aboard. The ship was in Brazil, about to sail for Australia. German spies in Rio de Janeiro had discovered the ship’s sailing schedule and route around Cape Horn and radioed the information to Nazi headquarters. German U-boats were ordered to sink the liner at all costs. But, thanks to the Scituate monitoring station, the United Kingdom’s Royal Navy sent last minute secret course changes to the Queen Mary and she arrived safely in the Pacific with her precious cargo of fighting men. The head of the German Navy’s U-boat service, Admiral Karl Doenitz, thinking his transmissions were secure, kept up continuous radio contact with his submarines throughout the war, unaware that even with the sophisticated Enigma encryption machines, his electronic mail was being read. In yet another incident that demonstrated the unusual sensitivity of the monitoring facilities, receivers picked up a signal from a remote transmitter near Alaska’s Aleutian Islands. It turned out to be a nearby Russian station and the location, at first thought to be a Japanese facility, was saved from a U.S. air attack. Chopmist Hill technicians also assisted in air-sea rescue missions, using direction finders to zero in on downed aircraft around the world. Among those saved were 22 wounded soldiers whose plane went down in Labrador, as well as popular entertainer Kay Francis whose plane crashed in Florida while returning from a USO tour in Europe. It does seem a little hard to believe that a spot in Rhode Island could play such a vital role. Army officials were especially skeptical and so FCC Commissioner Sterling guaranteed them his technicians could pinpoint the location of any transmission within 15 minutes. The Army set up a test, sending a signal from inside the Pentagon. Seven minutes after their message was sent, Scituate reported receipt and location. In November of 1945, after the existence of the station had been revealed, the government allowed Thomas Cave to be interviewed by the Providence Journal. He told the reporter “virtually all the wartime messages sent by German spies in the U.S. were intercepted in Scituate”. 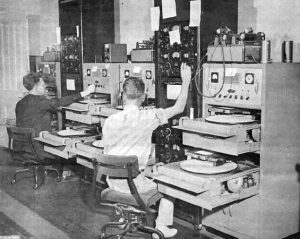 After the war, Cave and a few other technicians stayed on to continue monitoring activities, this time focusing on illegal domestic radio transmissions. There’s one more twist to this story. 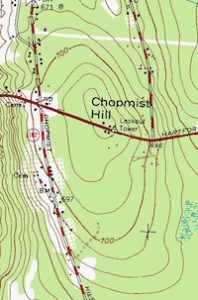 And that revolves around the interesting fact that Chopmist Hill was briefly considered for the site of the headquarters of the United Nations. In January of 1946, a team of inspectors visited Scituate, RI. The UN had agreed to set up shop in the United States. Scituate town councilman and local forest ranger George Matteson convinced the UN inspectors to pay a visit. They were especially impressed with the fact that Scituate could serve as a unique worldwide communications hub. There was enough available land to build the anticipated facilities for the headquarters. It was within easy access to air transportation and a relatively small number of people would have to be relocated. Governor (later Senator) John O. Pastore met with the inspection team and pressed the case for Rhode Island. But, alas, the state didn’t stay long in the running. New York City was chosen after John D. Rockefeller, Jr. gave the UN $8.5 million to enable them to purchase their ultimate location along Manhattan’s East River. So, Chopmist Hill quietly returned to its pre-war bucolic existence. The FCC stayed until 1950. The State of Rhode Island then took over the property and used it as the state’s Civil Defense headquarters for the next fifteen years or so. Eventually, the property reverted to private ownership. 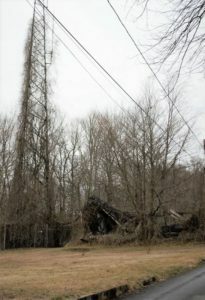 Small traces of the station remain to this day, with stumps of the utility poles still visible. The former Suddard farmhouse on Darby Road is an attractive private residence behind its original stone wall. There are few, if any, visible clues to the secrets that it once held. The area is surrounded by new homes, equipped with modern electronic devices that were only imagined when those World War II radio technicians conducted their clandestine activities. There could still be a few more secrets yet to be revealed. As it happens, not all of the activities of Chopmist Hill have been made public. Some classified documents about the FCC monitoring station program will not be released until 2049.